Come spend a day fly fishing with Rusti and you’ll know the joy of fly fishing as it is meant to be! She has spent a lifetime enjoying the sport with family and friends and early on became a guide. Her gratitude for life and fun took her on an around-the-world adventure, serving our great country with the United States Navy. Rusti’s gentleness, coupled with her years of experience guiding and her absolute fun nature make spending time with her a reward in itself. She shares a love of hunting, fishing, water sports, and anything outdoors with her son, Cayden. 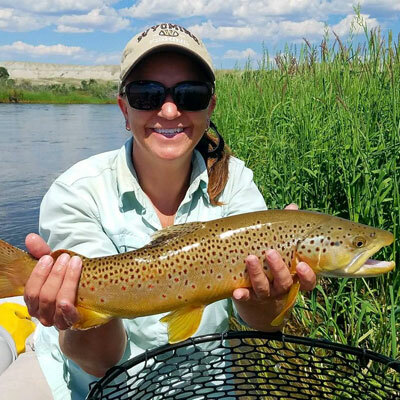 Her approach to life is best showcased on a guided day trip, where she gets to impart to those around her a vast knowledge of the beautiful surroundings, expertise in reeling ’em in, and how to find your own secret fishing spot. If you’re curious about the usual fishing bio information like, “Where she is from?” “Who gave her such a love for having fun outdoors?” “How long she has been fishing or guiding?” “Where are her favorite fishing holes or streams?” Or even, “What is her favorite fish?” you’ll have to give us a call at Two Rivers and book your trip to find out.